I probably took it for granted when I was little, but I have to give my mother some credit for always having a delicious breakfast on the table for us in the morning. Yes, there were simple meals of cereal and fruit, but there were also plenty of days where Mom would be in the kitchen making homemade muffins, perfect pancakes, divine french toast and other first-meal-of-the-day favorites. Now that I'm a mom, those yummy childhood memories inspire me to do the same for my family. Maybe it's because of back-to-school, but lately, I've been getting a lot of SOS messages from moms asking for fast but filling breakfast ideas. I'm not suggesting that recipes like this one for Banana Waffles are really going to make it onto your table in 60 seconds, but where there's a will there's a way. If the thought of making something from scratch at 7am is unappealing to you, how about mixing the wet and dry ingredients separately the night before? Then, all you have to do in the morning is mix them together in a bowl and scoop some batter into the waffle iron. Simple. But if that's still to much for you when you're feeling bleary eyed, exhausted and just want to get everyone out the door well-fed, follow in my foot steps. I like to make a huge batch of these waffles on the weekend and store them in labeled freezer bags so all cooking breakfast entails for me is warming some in the toaster oven and serving with fresh fruit or syrup. It's easier than putting out cereal and by the time everyone's at the table you'll look like you made them the perfect breakfast from scratch and give your little ones a life-long feeling that Mom always cared about giving them the best -- even at the crack of dawn! 2. Place the first 5 ingredients in a bowl and combine. 3. Place the remaining wet ingredients in a separate bowl and combine. 4. Slowly add the dry ingredients into the wet until combined. Do not over mix, its ok if there are a few lumps. 5. Pour 1/2 cup of batter into a greased waffle iron and cook for about 3-4 minutes (or according to manufacturer’s directions). * Place leftover waffles in labeled freezer bags. Pop in the toaster until warmed through to serve. Perfect find! I just eyebald the v. ripe bananas (2) in the kitchen, went under weelicious... and voila! These look wonderful! I am always looking for new healthy waffle and pancake recipes to add variety. I always make large batches of pancakes, waffles and french toast on the weekend, freeze, and then - viola! Breakfast is ready for busy school mornings. I always include some whole wheat flour and flax seed meal in our breakfasts, too. Great with all natural chicken breakfast sausage to add protein. hi, how do you thaw your frozen pancakes etc in time for breakfast? Looks delicious. I'm looking for a good waffle iron that doesn't take up much space. Any recommendations? I would go to Target, Walmart, Sur La Table etc.. and check out their selection to get something that fits your space. Perfect timing! I finally bought a waffle maker this weekend, can't wait to try these!! I have a tiny fridge so having 2 bowls in the fridge just wouldn't work. Could I mix up the batter in one bowl or do the wet and dry really have to be separate overnight? I say give it a whirl. I bet it would be fine. Ahh your wonderful recipes using too ripe bananas never seize to amaze! Bananas go fast in my house but I buy a bunch and am always looking for ways to use them when they get too ripe. Thanks so much for yet another wonderful recipe! I'm a little confused &amp; this might be a dumb question. Are you really supposed to add the flour through milk in one bowl, and then the rest of the ingredients in a separate bowl? Or is the cinnamon supposed to be higher up on the ingredient list so just dry ingredients are in one bowl and wet in another....? 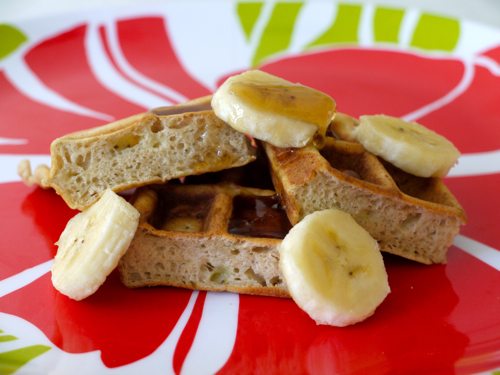 I will try this soon as I have some bananas left :) but I am going to serve the waffles for lunch. I am from Germany and our breakfast is a bit different from the American. We eat bread, muesli and other cereals for breakfast. My kids eat cereals most time at home and get a breakfast bento with bread for school and on the longer schooldays also a packed lunch. I really like to see what dishes you prepare for your family. I have already tried some of your recipes :) Thanks for all your efforts! hello! i dont have a waffle iron...would this batter be okay served as pancakes? bag is genius. You have to try them. A bit late in replying but it's possible you over mixed the wet and dry ingredients together. Waffle and pancake mix should be mixed until just combined (lumps are ok) or else you end up with chewy waffles and pancakes! I hope you've had better luck with them since! I know you are quite into \"green\" and healthy products. Am wondering what sort of waffle iron you use? I've tried to purge teflon from my home, and all of the waffle irons I've seen are made of Teflon. Any ideas??? I wonder the same thing!!!! Did you get a response? Can you use all purpose flour as a substitute for the whole wheat flour? These were awesome! I used whole wheat (ground my own) and flax instead of all purpose flour. The kids and hubby loved them. The only problem is there wasn't enough. Two kids (2 and 6) ate most of them so we just got a taste. Will double the recipe next time. Thanks for a great recipe! Thank you!!! We just bought a waffle maker and my son requests waffles every AM so I'm using a mix. This is so much healthier and he adores bananas. Perfect!!! Once again--weelicious ROCKS!! These make the best pb&amp;j sandwiches! I am going to have to start doubling the recipe if we ever hope to have enough leftovers to freeze. These are our favorite waffles. I started making them this morning have all of the ingredients and realize I don't have eggs. Is there anything you know of that could be a substitute? You can use 1 tbsp of flax seed powder plus 3 tbsp of water to equal one egg. I have heard that bananas are a great egg replacement, but I haven't tried to leave out the egg in this recipe. These are so great! My toddler will not eat eggs, plain pancakes, or plain waffles (my breakfast ideas are getting pretty slim). He loves these and it is a great feeling as a parent to find healthy food that our children will love! My hubby and little guy made these this morning. Delicious! I made this batter this morning and used for pancakes as I don't have a waffle maker. It was delicious. Thanks for the recipe. OMG! So I lucked into a waffle maker for cheap and this recipe was awesome and simple. I did some variations due to my dietary lifestyle. I did half and half of the flour mixture and almond milk to cut back on the cals. Also, I am diabetic so I used splenda. The waffles came out nice and fluffly regardless. Will use again. Hi! I made these this morning, and while delicious (and a hit with my 18 mth old:), they were really dense and chewy. I barely stirred the batter so I don't think I overmixed....but the batter seemed awfully thick and not batter-like at all. Any advice on where I went wrong? What is the consistency of the batter supposed to be like? Thanks so much! Tried these out for my munchkins! Added some Choc chips for Saturday fun! Added 1 c of water to thin out the batter and it seemed to really help the texture! Shared your recipe over at https://www.facebook.com/TheEvolutionOfMom today! So I know it's recommended not to feed honey to infants under one but it is okay when it's cooked in something (like this recipe)? I would love to give some of this to my 8 month old but the honey makes me nervous. Thanks! I wouldn't risk it. You can feed them cooked honey only if it has gotten hot enough to kill any potential spores. You can use agave nectar to sweet these instead!